A Marine Corps F-35B has been used in combat for the first time, in an airstrike in Afghanistan. The U.S. Marine Corps F-35B joint strike fighter has successfully conducted its first combat mission over Afghanistan, U.S. officials confirmed to Military Times. 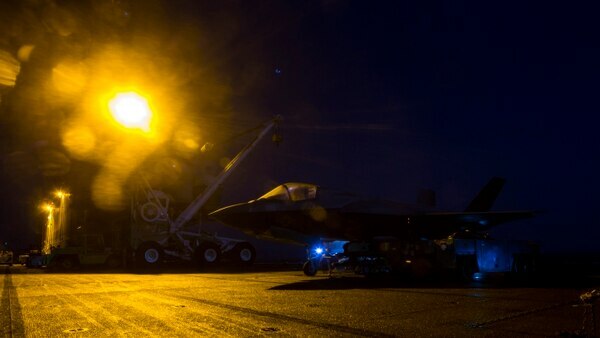 The strikes, carried out by F-35Bs assigned to the 13th Marine Expeditionary Unit, occurred Thursday morning against a fixed target “in support of ground clearance operations,” and were deemed a success by the ground force commander, according to a statement put out by U.S. Naval Forces Central Command on Thursday afternoon. Marine Fighter Attack Squadron 211 made history earlier this month as they became the first squadron with F-35Bs to deploy to the U.S. Central Command area of operations aboard the Wasp-class amphibious assault ship Essex. “The opportunity for us to be the first Navy, Marine Corps team to employ the F-35B in support of maneuver forces on the ground demonstrates one aspect of the capabilities this platform brings to the region, our allies, and our partners,” said Col. Chandler Nelms, commanding officer of the 13th MEU. The entrance of the F-35 into CENTCOM puts the high-tech fighter one step closer to the fight in the Middle East. The Marine Corps declared the F-35B operational in 2015, becoming the first service to integrate the joint strike fighter into its fleet. The Air Force followed by declaring initial operational capability for the F-35A conventional variant in 2016, while the Navy plans to declare IOC on the F-35C carrier variant in February 2019. The joint strike fighter is the most expensive program in the Pentagon’s history, projected to cost about $1 trillion to develop, produce, field and sustain over its lifetime, according to the Government Accountability Office. The F-35B is the short takeoff, vertical landing variant of the aircraft, allowing the pilot to hover and land vertically like a helicopter — a necessity for the Marines, which typically operate from amphibious ships with smaller decks than aircraft carriers. The Marine Corps reported its first loss of an F-35 earlier this year, after damage from a fire two years ago led the service to scrap that plane from its inventory.